After spending a few days traipsing through Burgundy, the Englishman and I packed up our rental car and headed north to spend a couple of days Champagne Tasting in Epernay. I thought Burgundy was tough to top, but I fell in LOVE with Epernay. I’m already plotting my return because I loved this charming town so much. 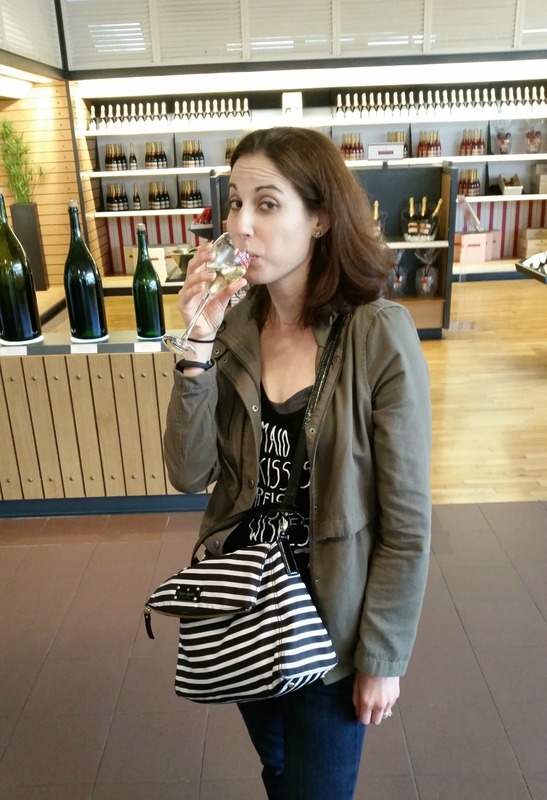 As a big lover of the bubbly, I was quite excited to do some champagne tasting in Epernay, and the city definitely did not disappoint. Right in the center of the city is the Avenue de Champagne, which is home to some of the world’s most famous champagne houses including Mercier, Moet et Chandon and Perrier Jouet. The Englishman and i decided to start our champagne filled day with at tour at Mercier. 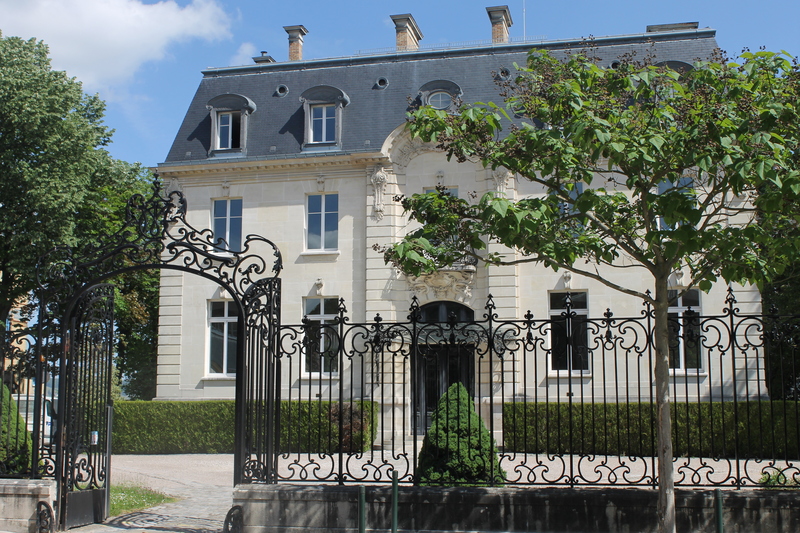 Mercier is one of the first champagne houses to be built in Epernay and one of the only to offer a tour of their working cellars. 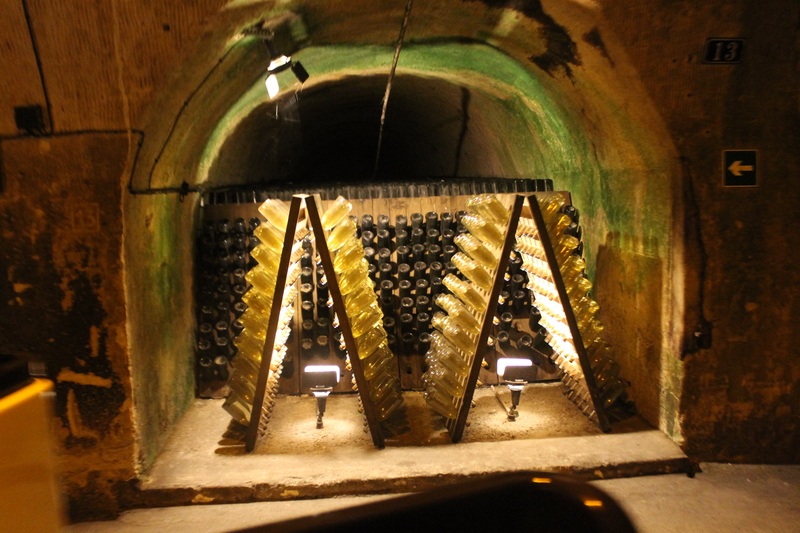 After a brief overview of the history of Mercier, we were whisked down 30 meters underground to start the tour. We hopped on a little train and listened to an audio tour that explained the champagne making process from picking the grapes, to bottling and distribution. It was really interesting to learn about the process from start to finish and I loved seeing the working cellar in action. At the end of the tour we were greeted with a glass of champagne which was a nice touch. Nothing like starting off your morning with a glass of bubbly at 10:30am! After our tour of Mercier, the Englishman and I started to pop in and out of various champagne houses along the Avenue de Champagne for tasting. 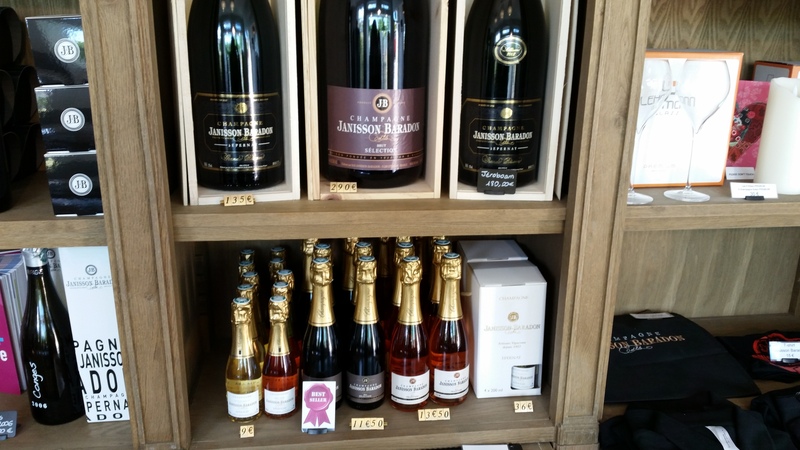 The crazy thing about champagne tasting in Epernay is that the prices are so cheap! 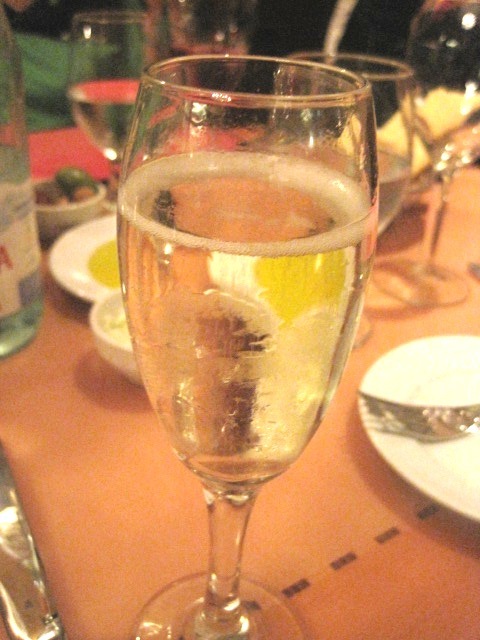 You can get a really high quality glass of champagne for roughly 4-6 Euro, which is about 6-8 US dollars (based on the current exchange rate). 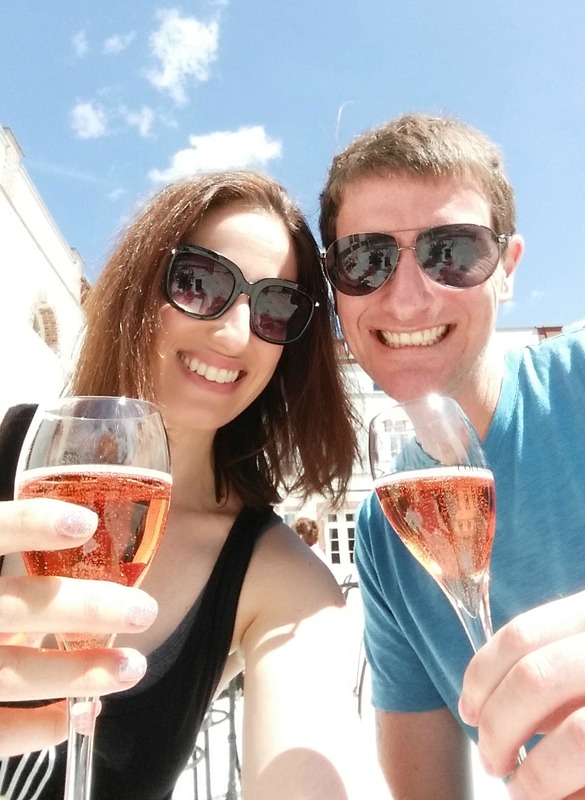 The Englishman and I are both fans of champagnes that are more on the dry side and not very sweet at all, so we pretty much loved every glass that we tasted throughout the day. The last house we visited was Janisson-Baradon, where we ended up having a lovely conversation with one of the owners, who is hoping to get distribution in the states one day. His champagne was our favorite of the day, so we ended up buying a couple of bottles to smuggle home to the US. Of course no day of champagne tasting is complete without an amazing French meal after, but I’ll recap that in another post because it was THAT good. 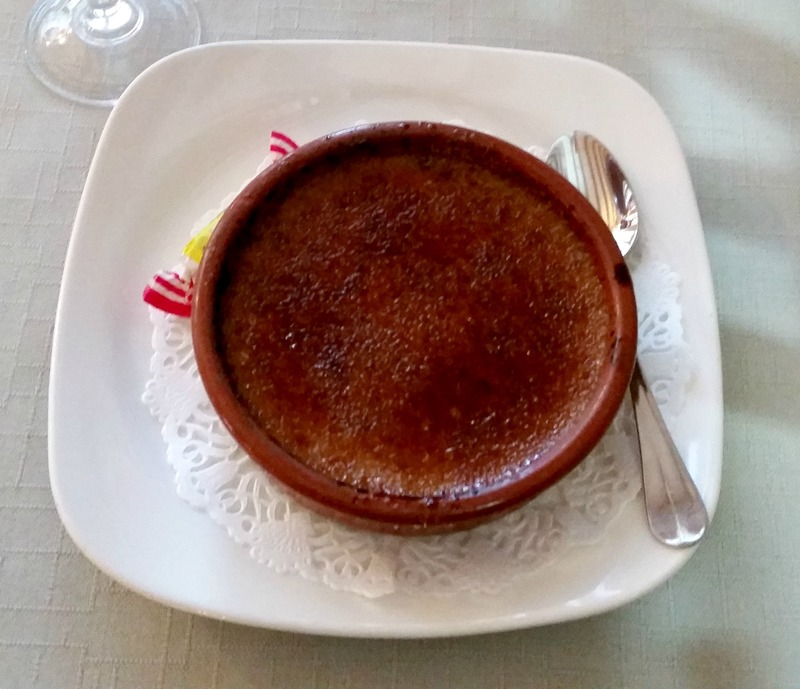 I do have to give a little shout out to the creme brulee we had one night in Epernay, because it was probably the best creme brulee I’ve had in my life. Even if you aren’t a big champagne drinker (like the Englishman), I feel like Epernay is a must-visit if you find yourself in France. The food is fabulous, the people are super friendly and the champagne is GOOD. Now if only I could get a job at one of the champagne houses…. 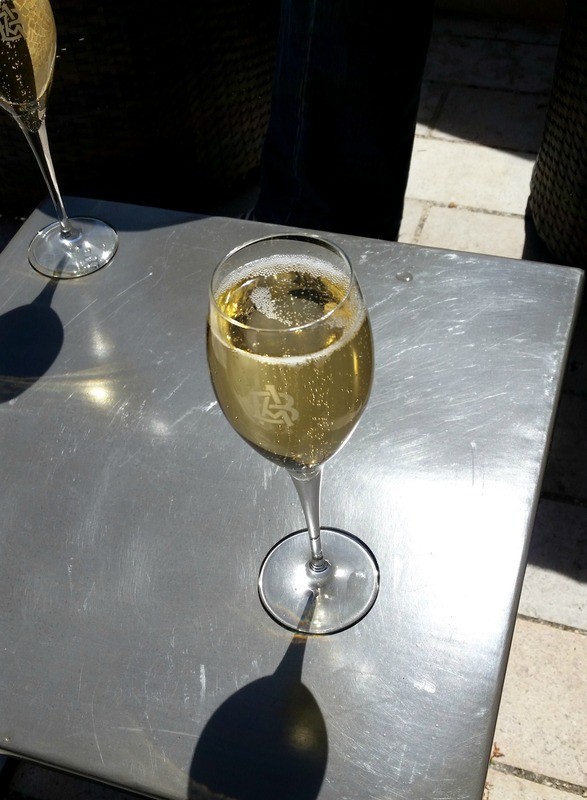 This entry was posted in Best Of, Beverage, Europe, Life, Travel and tagged champagne, epernay, france, travel on June 1, 2015 by allie@sweetpotatobites. Have you been watching the Great British Baking Show on PBS? The Englishman and I are pretty obsessed and look forward to it every week. Watching the show has made me inspired to bake more British desserts, and what better way to start than with a steamed chocolate pudding? When you normally hear the word pudding in the US, you immediately think of the classic custard dessert or the jello variety. But in the UK, pudding is actually more along the lines of a sponge cake covered in some sort of sauce (a fact I did not learn until I met my husband). And steamed pudding is a sponge cake that is well, steamed. To prepare myself to create a steamed chocolate pudding, I watched Paul Hollywood’s Pies and Puds series on you tube to figure out the best way to create a proper pud. Oh, and I should mention that steamed pudding is one of the Englishman’s favorite desserts, so no pressure right? RIght. I found a recipe online and then adapted it based on the tools that I had. You see, normally steamed pudding is made in a pudding mold, but since I did not have one of those, I used a glass pyrex dish instead and it worked out beautifully. The art of making a steamed pudding is to make sure the cake is still light and spongy, but gets cooked all the way through. For my pud, I used a 4 cup pyrex bowl and steamed it for about an hour. I think next time I’ll steam it for about 55 minutes since the cake was not quite the light spongy texture I was aiming for. 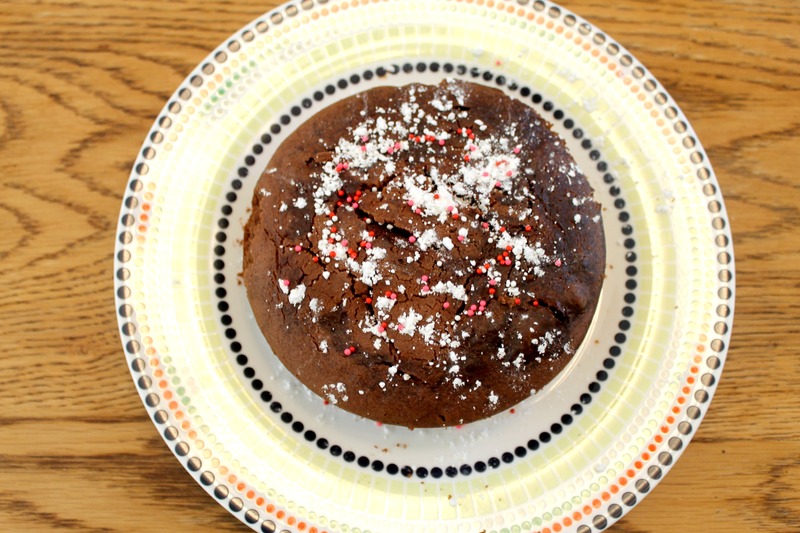 Overall, the steamed chocolate pudding was relatively easy to make and the Englishman loved it, so I consider it a win in my book. Cream your butter and sugar. Fold in your flour, salt, cream of tartar, and baking soda and continue to mix until well blended. 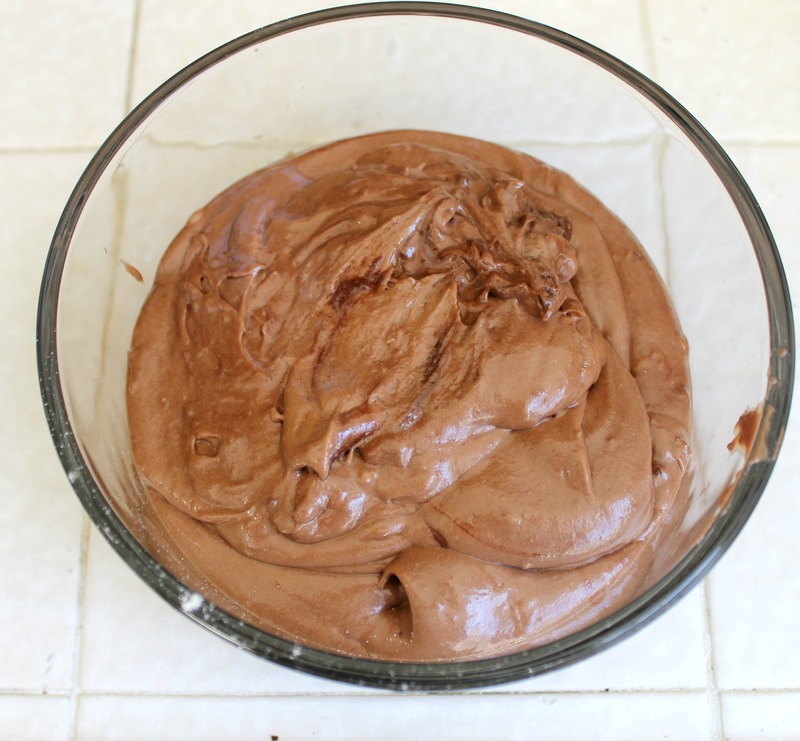 Gently fold in your chocolate and almond milk and continue to mix. Pour batter into a greased pudding mold or pyrex dish. 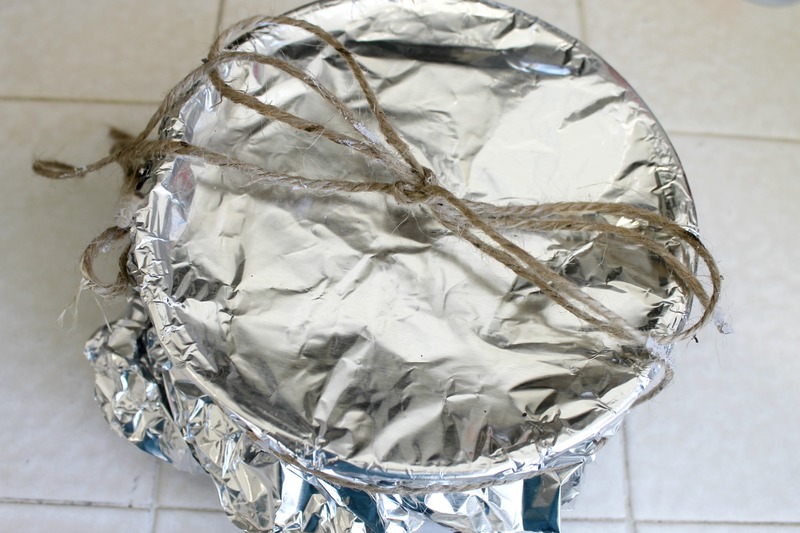 If you don’t have a pudding mold cover your dish with foil and tie a string around it so it’s easy to remove (thanks for the tip Paul Hollywood). Fill a deep pot with about 1 inch of water and bring to a boil. 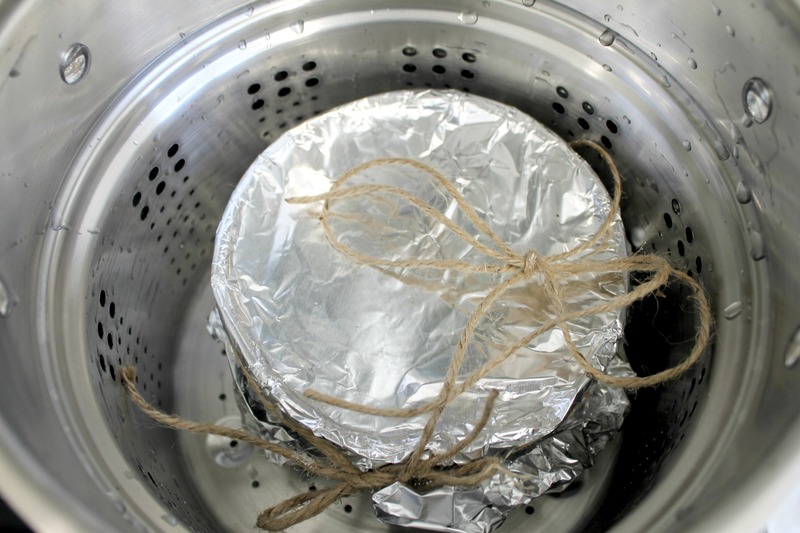 Place your steamer or a rack on top of the pot and then gently place your pudding in the steamer. I highly recommend using a steamer for this step. Cover the pot with a lid and bring the water down to a simmer. Let your pudding cook for 50-55 minutes, and additional water to the steamer if needed. Once your pudding is done steaming, remove from the steamer and let it cool. Normally the pudding is covered in a sauce, but I decided to give it a Valentine’s Day flair and added pink and red sprinkles and powdered sugar. Overall I was really impressed how the steamed chocolate pudding turned out! The flavor was spot on and it was a delightful cake that we had with breakfast and tea the next day. I will admit the overall process is quite time intensive, but I’ll definitely try my hand at steamed pudding again. 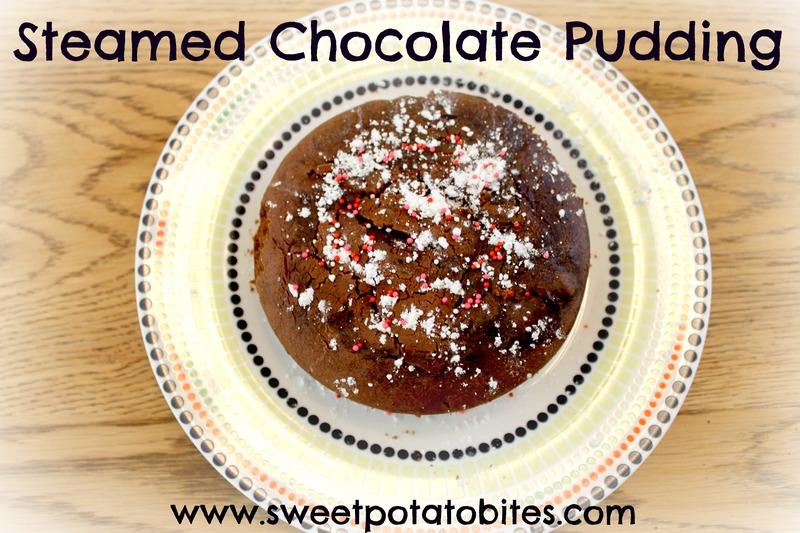 This entry was posted in Baking, Best Of, Dessert, Europe and tagged great british baking show, pudding on February 18, 2015 by allie@sweetpotatobites. If you’ve ever been to Europe, or wandered through the aisles of World Market, chances are you have stumbled upon digestive biscuits. 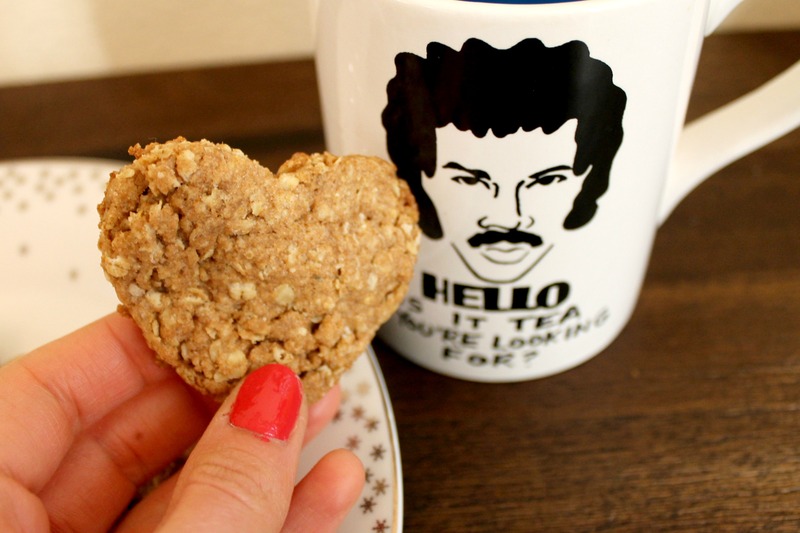 And for those not familiar, digestive biscuits are a delightful cookie made from wholemeal flour and oats, and are the perfect vehicle for dipping in a cup of tea. 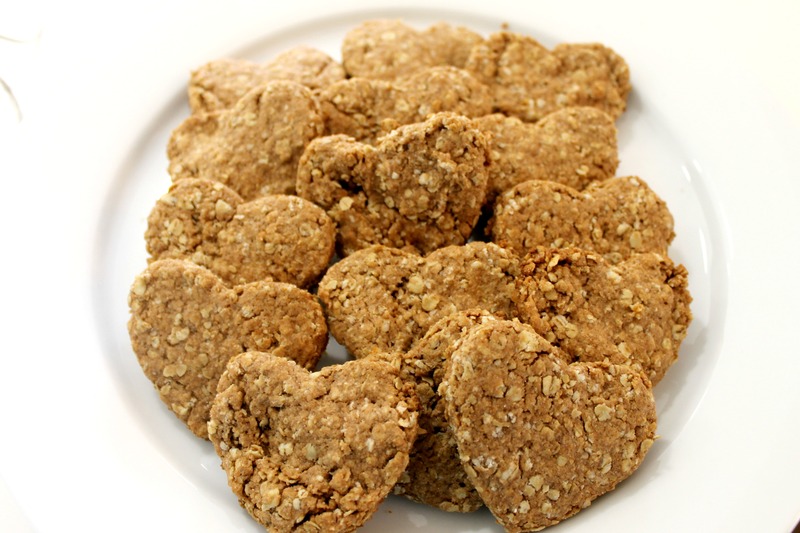 So for Valentine’s Day this year, I decided to make the Englishman Homemade Digestive Biscuits. Truth be told, this post was supposed to go up on Valentine’s Day, but between work, wedding planning, and just life in general that didn’t happen. So this is your post-Valentine’s Day treat. Whenever I used to visit the Englishman in London, I’d always insist we get a pack of McVittie’s Digestives (usually the chocolate ones) and we’d dip them in a cup of tea for an afternoon snack. Digestive biscuits are generally less sweeter than the traditional American cookie, and have a bit more of a hearty texture to them overall. When I decided to make my own digestive biscuits, my goal was to keep the texture and flavor of the biscuit as close to the original as possible. The beauty of this recipe is that it requires minimal ingredients, is easy to make, and can even be made vegan if you swap the butter for a dairy-free alternative like coconut oil. Combine all of your ingredients in a large bowl and mix together either using a hand or stand mixer. Once all the ingredients are well blended, remove your dough and wrap in saran wrap and place in the fridge for 15 minutes. Remove your dough from the fridge and begin to roll out. 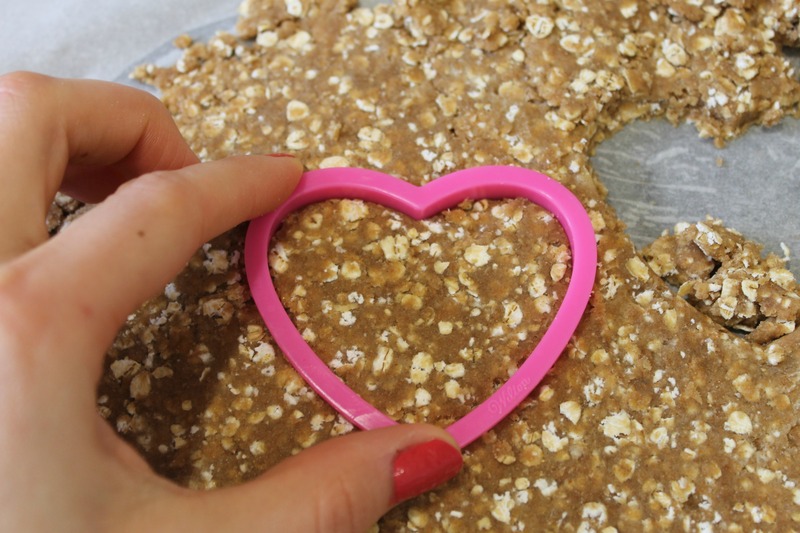 The traditional digestive biscuit is cut into circular shapes, but because I was feeling festive for Valentine’s Day, I used a heart-shaped cookie cutter instead. Place your biscuits on a baking sheet lined with parchment and pop into the oven for 15 minutes, or until the tops are a nice golden brown. Pull your biscuits from the oven and let them cool. If you are feeling fancy you can spread some jam or even chocolate peanut butter on your biscuits. I found these biscuits to be the perfect afternoon snack (with a cup of tea of course) while I was laid up on the couch all day Sunday after being hit by a cyclist while running. Like I said, it’s been a week. Thank goodness for my awesome fiancée and this Lionel Richie mug. 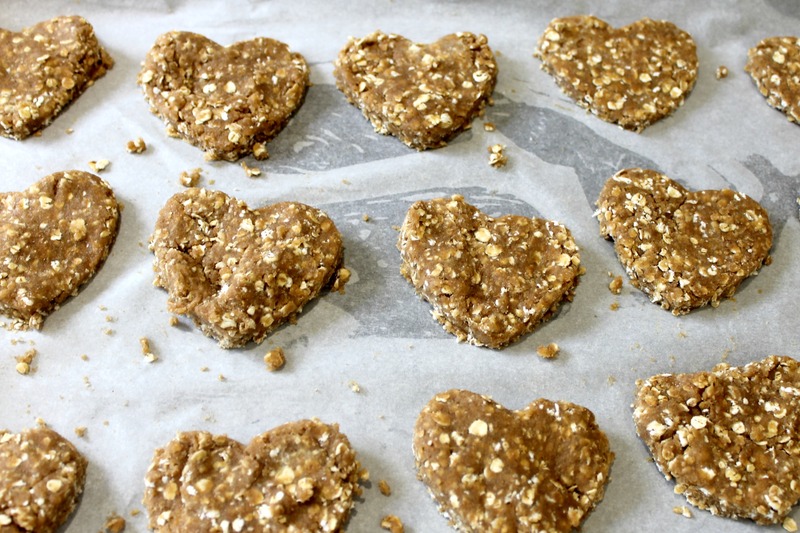 Needless to say, you need these homemade digestive biscuits in your life. They truly are the perfect pick me up. 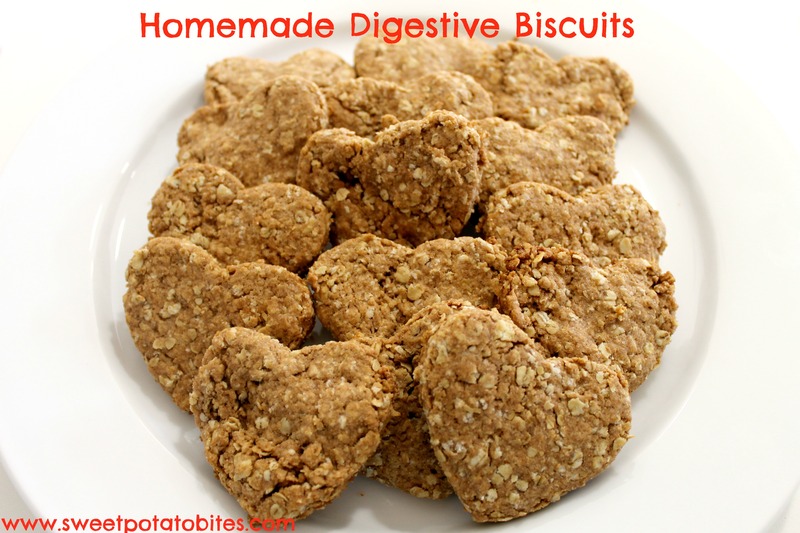 Who else has tried digestive biscuits before? 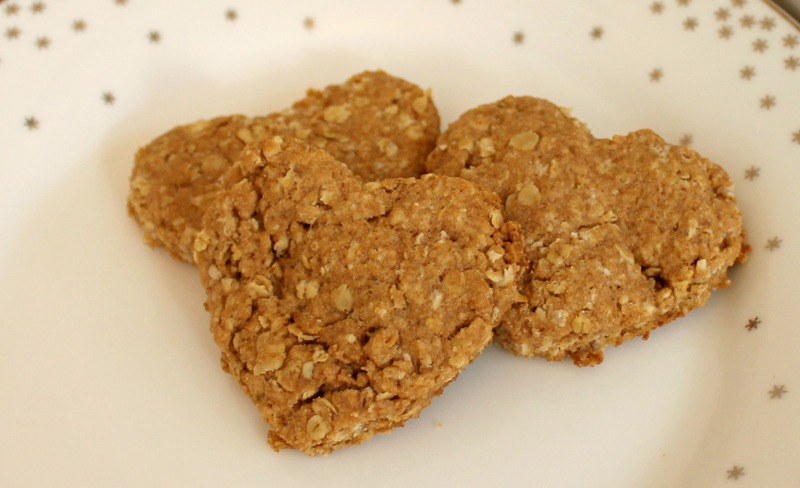 This entry was posted in Baking, Best Of, Europe and tagged Digestive Biscuits, England, oats on February 17, 2014 by allie@sweetpotatobites. 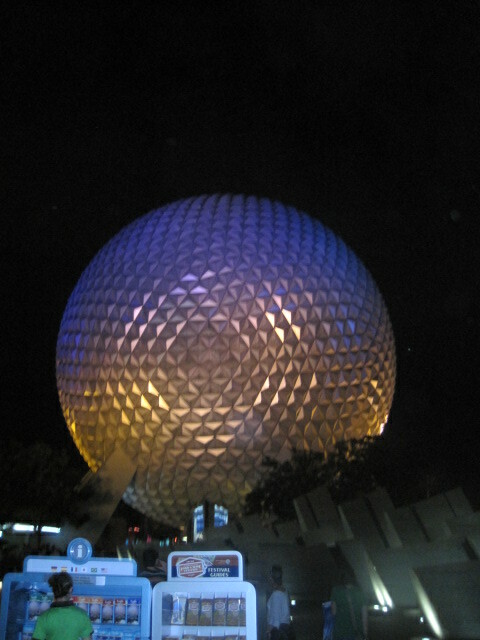 *For those of you who have not been to Epcot – the theme park is divided into two parts: Future World and the International Showcase. The International Showcase has a bunch of different “countries” that offer dining, shopping, and some attractions. The plan was to have dinner in one of the countries. After working an extra long day, my coworkers and I bounded over to Epcot with hopes of putting delicious food in our bellies along with a bottle (or two) of wine. The park seemed a bit crowded but we made our way in and headed straight over to the International Showcase with visions of delicious food dancing through our heads. The realization has sunk in that we are smack dab in the middle of Epcot’s Food and Wine Festival, so finding a place to eat might be challenging, as the park is pretty crowded. Onward we march to Canada. The nice hostess at the Canadian steakhouse kindly informs us there is no room at the restaurant as they are at capacity and closing soon. She suggests we try sushi in Japan. Make the long walk over to Japan. Get distracted/annoyed by all of the food and wine festival guests who are stopping at various food vendors along the way. Consider getting a gyro from a Greek stand and calling it a night. Me: Do you have a table available for a party of 5? French Host: Oui. What is your name? Me: Is there a wait to be seated? French Host: I don’t know. Maybe? But we do have a table. French Host: Well I have good news, I can seat you! But not your friends. Me: Umm, that’s not going to work. So you don’t have a table then. French Host: No we do have a table. I just don’t know when it will be open. Me: Ok, thank you (starts to walk off). French Host: So you aren’t waiting? Arrive in Japan. Are informed it is a 20-30 minute wait. Everyone is about to gnaw their arm off. One of my coworkers and I decide to take matters into our own hands. Arrive in Italy. Beg the host at Tutto Italia to seat us even though they are ending seating in 10 minutes. Host says we can sit as long as we have our entire party. Frantically call other coworkers and tell them to come down immediately. Finally seated for dinner without a moment to spare. The Host assumes we are a soccer team because we are all wearing green shirts (from work). Promptly order a bottle of wine and glasses of prosecco. Are you all still with me? Now let’s get to the important stuff, like the food. As I mentioned above, we started our meal off with some wine and prosecco and some freshly baked bread which was promptly devoured. For the appetizer course I went with the roasted eggplant. I was so hungry that I neglected to take a photo. It was good, but nothing super exceptional. Just nice, Italian comfort food. 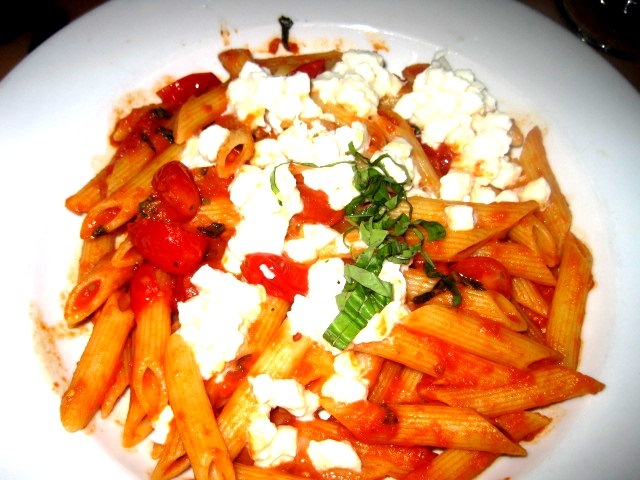 For my entrée I rolled with the Caprese Pasta that had penne, tomatoes and mozzarella. This was actually a lot better than I expected! The pasta was cooked perfectly and the mozzarella was nice and creamy. For theme park dining, this was pretty decent. While the food at Tutto Italia is definitely overpriced (thank goodness I was not paying), the dishes are definitely higher quality than your typical theme park food. Plus, the decor was all cute and cozy and reminded me of being in Italy, so that was an added bonus. We left the restaurant in a happy carb-filled coma, and promptly passed out upon returning to the hotel. Thanks, Epcot, for saving us from dying of hunger. Random Fun Fact: All the employees in the International Showcase have to be originally from the country they work in, like our server at Tutto Italia who was born in Milan but now lives in Florida. Learn something new everyday I tell you. 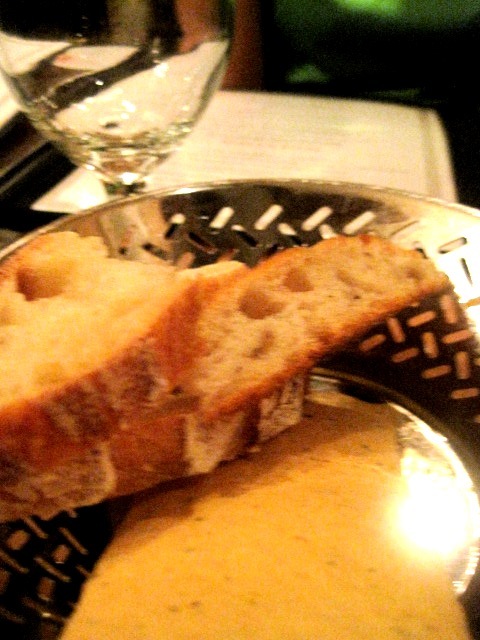 This entry was posted in Dinner, Europe, Fine Dining, Uncategorized and tagged Epcot Center, International Showcase, Italian Food, Italy at Epcot Center, Orlando, Tutto Italia on October 13, 2011 by allie@sweetpotatobites.